As we learnt in Noah, God is terribly cruel and merciless. In that movie he committed genocide without a remorse and nowadays, on screens we got a new example of this callous behaviour: Exodus. Gods and Kings. In this case, God wants the Egyptians to free the Hebrews. What would you do to free them if you are an allmighty being? a) Simply to order it. b) Put every single Egyptian into a deep dream and let the Hebrews flee freely. c) Create the human beings to be good people and to get a friendly solution, without a dispute. d) Send 10 different and horrible plagues that kill practically every animal in Egypt, and of course every little baby, causing a brutal suffering to each family in the country. If you are a cruel god, you know that the right answer is “d”. Rhamses (and I guess practically every viewer of the movie) doesn’t understand a god so terrible, so he asks Moses: “What kind of fanatics worship this God?”. Well, in this movie that awful God is a creepy boy that is a perfect mixture between Caillou and a midget. I’m sure that Ridley Scott saw the achondroplasic devil of Lords of Salem and said: “Hey, if they got a tiny devil we fight back with our own tiny god”. 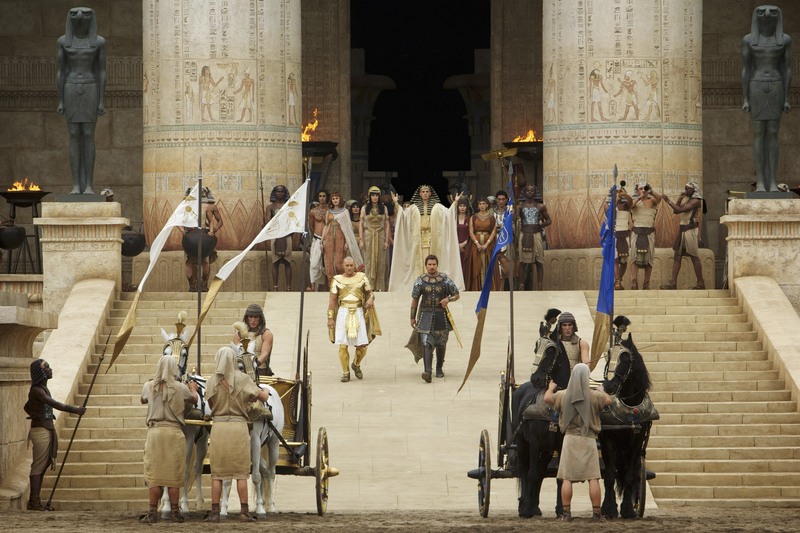 If you want to see Exodus you must know it’s “only” 150 minutes of already known information and a lot of yawnings, and although they have hundreds of extras even the battles are boring. Someone should have also said to Scott that the nose of the Sphynx was destroyed in times of Napoleon, many many years after this myth. And to make the story a bit more real, that the pyramids were never built by slaves, Hebrews or whoever. I know that slaves whipped dragging huge blocks it’s quite cinematographic but it’s not real, although many people believe it. You are now warned but you are free to enter at your own risk.